Hello. In this tutorial post I am going to show you how I made my simplified version of Craps. The purpose of this tutorial is to show the basics of using the HTML5 canvas tag and drawing simple 2D shapes. You can see the game in action on my website. To start off lets lay out the simple rules so we know what we are trying to accomplish. On a roll of 7 or 11 the player wins. On a roll of 2, 3, or 12 the player looses. Any other roll is stored as the players ‘Point’ and a Follow Up Roll is played. On a roll of the players ‘Point’ the player wins. Any other roll is discarded and play continues with another Follow Up Roll. This is a very simplified version that only takes into account one player. If you want to expand this simple game with the full rules you can check out the wikipedia article for more info. This is the canvas tag. This is where we will be drawing out the dice when the player makes a roll. You can use the canvas tag to draw anything you need be it simple 2D graphics, 3D scenes, or just about anything you can think of. We will be covering how to draw basic 2D shapes. I do not use anything out of the ordinary for the CSS so I won’t go over that in detail but for completeness here is the CSS code I use. Our next variable is ctx. This holds our canvas context object. We use this object to draw the dice onto the canvas. We will learn how to use it in more detail as we go over each function used in the game. The last 7 variables holds various information needed to process each roll. We start with roll1, roll2, and rolltotal. Each of these store the current die roll and the total of the two. Next is point. This will store the current rounds ‘Point’ value. Then comes round. Here is a simple string to distinguish what round we are on. I could have used a boolean variable here which may be a better choice in the end. It’s not hard to change the code to use a boolean instead of a string so feel free to make the necessary adjustments. Next we store the players ‘total loot’ in a variable called total_loot. This will increase or decrease as the game goes by depending on if the player won or lost a round. The last variable needed is current_bet. This will keep track of the players current bet. The player wil have a chance to change this before each round starts. After this I have a basic initialize function called when the page is loaded. // be in their default state. We start off this function by setting the dicex variable to it’s default of 25. This will make sure when when actually draw the dice the first die will be drawn in the correct position. Next we get two random numbers and assign them to roll1, and roll2. We repeat the above to get a random value for roll2. Next we add the two rolls together to get the value we will be using to check against for the rest of the function. You may wonder why I am getting two random numbers between 1 and 6 and not one random number between 2 and 12. I could have done this but I would have to split the number somehow in order to display the values of each individual die when we go to draw the dice. This way will make it much easier to call the drawing function to draw each individual die. The next part of the function we determine what round we are in. If it is the Initial Roll we will be making different checks then if it is the Follow Up Roll. In the Initial Roll part of the if statement we use a switch() to see what the total roll is. If it is a 7 or 11 we display the message YOU WIN! then call the setScore() function to add the players bet to their total loot. If the total roll is either a 2, 3, or 12 we display the message YOU LOSE! then call setScore() to subtract the players bet from their total loot. If any other roll is found we set the point variable to the value of rolltotal and display the number in the Point box. We also update the round text to Follow Up Roll and update the round variable accordingly. If we are already on the Follow Up Roll we check to see if the rolltotal is equal to 7. If it is we display the YOU LOSE! text and call setScore() to subtract the players bet from their total loot. If this isn’t true we check to see if the rolltotal equals the players point value. If it does we display YOU WIN! and call setScore() to update the score appropriately. If any other number is rolled we ignore it and move on. Next we check to see if the players total_loot is less then or equal to 0. If it is we set the players total_loot to 0 then update the HTML Elements so the New Game button is showing. We then display the current totalroll in the appropriate spot. After this we call the crapsDrawFace() function to draw the result of roll1 onto the canvas. Next we move dicex over the width of the die plus 50. Lastly we call crapsDrawFace() again to draw the results of roll2. crapsDrawFace() will take care of drawing the dice. I’ll be going over this function and it’s accompanying functions in a minute. Now we get to the fun part, crapsDrawFace(). This function will draw a die onto the canvas at dicex and dicey. This function will call other functions depending on the number we need to draw. These function are crapsDraw1(), crapsDraw2() and crapsDraw2mid(). I’ll go ever each in turn. The first thing we do inside this function is set the line width we will be drawing with. We do this by setting the lineWidth data member of our ctx variable. This is the complete call: ctx.lineWidth = 5;. 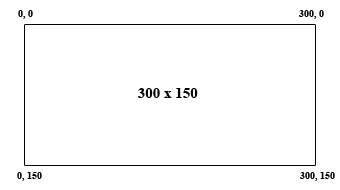 This is setting the width to 5px. The next function should look familiar. We used it in two previous functions. It’s the clearRect() function. The difference here is that w are clearing only the space that the dice is occupying. Next will set the fill color we want to use, in this instance #FFFFFF or white. We do this be setting the fillStyle data member of the ctx object. The next function is new, fillRect(). This function is identical to clearRect in all ways except one. the fillRect() function will fill the rectangle provided with the setting of fillStyle. This gives our dice a nice white background (if your game is on a white background you can skip this). Next we change the fillStyle so it is #000000 or black. We want this to be the color of the border for our dice. We create this by calling the function strokeRect(). Once again this takes the exact same parameters as clearRect() and fillRect(). The only difference here is that the function will stroke (put a border) around the outside of the rectangle with a width of lineWidth and the color stored in fillStyle. Lastly we set the fillStyle one last time to a nice green color, #009966. This color wil be used for the dots on the face of the dice. The function then uses a switch() statement to determine how to draw the dots. It will call one of the crapsDraw? () functions or a combination of them to accomplish this. All of these functions are almost identical besides how they calculate the dot position. I will show all three functions then go over the most interesting parts. * This function draws a dot in the center of the die. * This function draws a dot in two oposit corners (lower right and upper left). * If reverse is true it draws the dots in the oposite corners. * on the y axis. It is used to create the '6'. There are four functions that we are concerned with that we need to look at, beginPath(), arc(), closePath(), and finally fill(). I will go over arc() last as that is the more interesting function of the bunch (Don’t forget to add ctx. in front of each function call). To tell the context we want to start drawing a path we use the beginPath() function: We tell the context we are done when we call closePath(). We then can either use fill() or stroke() to either fill the path or stroke is accordingly. I do not use the stroke() function in this game but the work the same as fillRect() and strokeRect(). Finally at the end of the file we add the crapsInit() function to the document ready queue. I use jQuery but you can assign it in any manner that will work if you do not use the jQuery library. Thats about it for the code. When the page is initially loaded it will call the crapsInit() function. This will set the stage and display the New Game button. Once the player clicks this it will call the crapsNewGame() function and prompt the user to set the bet for the round. Once the player enters their bet and clicks the button the crapsSetButton() function is fired off. Next the player clicks the Roll Dice button to call crapsRollDice() until they either win or loose the round. At this point it prompts the player to enter another bet and play continues till either the player stops or looses all his loot. I hope this tutorial on how to build my simplified version of Craps was useful. The main parts I wanted to make sure to hit was how to draw basic 2d shapes on a canvas. You can do so much more with the canvas then I did here but hopefully this gave any one just jumping into HTML 5 some useful info to help them along. I plan on doing more tutorials based around more complex games that will take full advantage of the canvas. I will also do some 3D based ones as well. If you liked this let me know. If you found any mistakes or know how I can do something better don’t hesitate to submit a comment. A screenshot of me winning a round! This is a screenshot of me losing a round!